Unlike the other Scandanavian countries, Sweden doesn't produce alot of beer. Up until around the 1700's Sweden was one of the biggest producers of beer in Europe, but as spirits gained popularity the industry suffered immensely. Swedish beer has made a small recovery recently but most of the beers they produce are stouts of ill repute. Naturally when I saw a Swedish lager in the beer shop, in this rather striking can, I thought I had to try it. 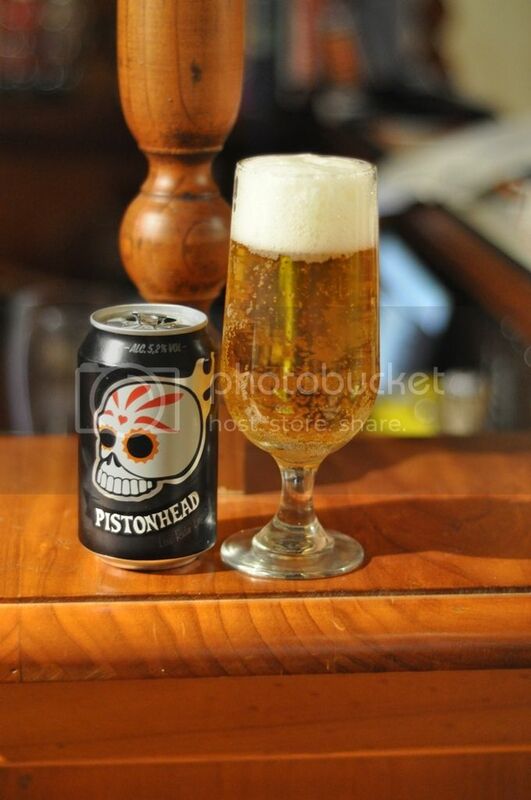 This is the "Low Ridin' Lager" from Pistonhead, which was only produced over last year's European summer. Hopefully this beer is as good as some of the craft breweries in other parts of Scandanavia. The pour is great, considering it's a canned beer. A really big hole, which goes right to the lip of the can definitely helps the beer pour smoothly. The colour is very yellow, almost too yellow for a lager and the beer has an amazingly large head. This head is off-white and dies down quite quickly to a one finger head, which hangs around for the duration of drinking. Lots of bubbles up the glass look fantastic, all in all a great looking beer. When you smell this beer for the first time there is definitely a mild sense of disappointment. A really sour malt dominates the aroma and there is an almost chemical-like bitterness about it. There is a miniscule ammount of citrus and yeast on the nose, but it really smells terrible. A very uninteresting lager on the nose, hopefully the taste is better. The one positive I can draw from this is that the taste of this beer is better, if only marginally. The malts taste surprisingly sweet at first but unfortunately this doesn't last... Bitter chemical flavour's destroy the flavour completely, I feel that they have tried to up the hop content in this beer and have just failed miserably. The aftertaste is almost sour, with far too much lemon, and lasts for far too long. It leaves a very bitter and disappointing taste in the back of the mouth. Despite this review, which does on a re-read seem very negative, the beer has potential. If they cut back on some of the hops/chemicals it could be a very nice beer. It has all the elements of an excellent summer beer; it's cold, wet and very crisp, shame it's lacking in good flavour. The packaging is pretty cool as well, I would imagine this is contributing strongly to sales currently, frankly because the beer is really bad. Basically, don't buy this beer this year, but if you see it (and remember) in a couple of year's time it might be worth a try.